Hello again, Catectives (cat detectives - did that work??)! Today we're excited to bring you the most gossip and clue heavy section of "Wish You Were Here" so far! We also discover we're able to turn anything into a mystery as we spend a bit too much time monitoring a suspicious (but probably only to us) situation on Julia's street ...because you know the old saying: "Something old, something new, something borrowed, something CLUE"! We're on the prowl, kitty sleuths! Today we've continuing to follow Mrs. Murphy and Tucker through the murderous small town escapades of Wish You Were Here from the Mrs. Murphy cozy mystery series! Join us as we follow the very turtle-y scent to try to catch the Crozet Killer! Happy Monday, kitty sleuths! Mercury might have retrograded and delayed our episode but nothing could keep us from bringing you a new surprise: the first in the Mrs. Murphy cozy mystery series! With Koko and Yum Yum's blessing, we're following Mrs. Murphy and Tucker as they help their human, small town postmistress Harry, solve a surprisingly gruesome murder for a cozy mystery. And all the clues point to... something that smells like a turtle? Help us follow the paw prints and see where the turtle smell leads! The planets have aligned! We've got the conclusion of Koko's origin story AND Eva & Julia's combined birthday celebrations! Because who says you can't solve a double homicide, open your birthday gifts and pet your cats all at once. Today we re-join Qwilleran and Koko as they sleuth for clues in an art world gone murder-crazy. Happy birthday to us!! Surprise! We've got a new installment in Koko's origin story for your weekend listening pleasure! We'll be back to our regularly scheduled reading this coming Monday but when birthdays and anti-hunger conferences abound, you just have to wing it sometimes. Today we finally get what we were promised: Koko at his first crime scene! We also have not one, but TWO more murders to investigate! Join us as things get more complicated than ever in the art and cat-loving world of Qwilleran and Koko! HAPPY BIRTHDAY, JULIA!! Eva went a little bonkers this morning and turned on her Masterpiece Theater voice to do a dramatic reading of the poem, "Macavity: The Mystery Cat" by T.S. Elliot from the book Julia gave her for Christmas, "Old Possum's Book of Practical Cats". We hope you enjoy this cat-infused insanity! We'll be back on Thursday with a new full epsidoe! It's Koko's origin story time! And we haven't met Koko yet... Today we tackle the first fourth of The Cat Who Could Read Backwards and while we do get a swanky Valentine's Day party and some salacious art world gossip, there's no Koko in sight. But don't worry we have our theories. And we ARE introduced to Qwilleran's mustache and get to witness his humble beginnings at the Daily Fluxion! Happy Monday! Happy Monday, Purranormal Investigators! We've got the dramatic conclusion to our series on Lilian Jackson Braun's The Cat Who Moved a Mountain hot and fresh for ya. We bring you the cat-sleuthed latest as Qwill yet again invites a murderer to his house, gets them drunk and accuses them of murder. But he does seem to have a special evidence "dust kitten" up his sleeve this time, so join us as we discover whether or not he makes it out of the Potato Mountains alive! Oh hello again, Purranormal Investigators! 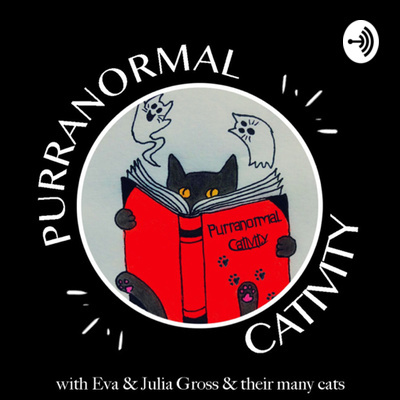 Today we've got part 3 of our series on The Cat Who Moved a Mountain and, don't worry Julia found yet another place where Lilian Jackson Braun references her own book title. We also follow Qwilleran to a waterfall catastrophe and talk about one of the most epic kitties of our childhood. Happy listening, PIs! Step aside Hatfields & McCoys... this week we're diving into a feud so cozy you won't be able to stand it, between the Spuds & Taters! We've got the second part in our series on Lilian Jackson Braun's The Cat Who Moved a Mountain so get ready for the scandal that rocked the Potato Mountains, both big and little! We've also got a bit of a cliffhanger involving Yum Yum's thieving paws and some insight into Qwilleran's thoughts on dogs. Happy listening, furry friends! Qwilleran, Koko and Yum Yum are back in action, folks! This week we're bringing you part one in our series on the next in the LJB cannon, "The Cat Who Moved a Mountain". And small warning, we talk more about cat vomit than we ever planned or wanted to, but thus is the life of a cat owner. Join us this week as we road trip from Pickax to Spudsboro for a whole new slam book of mysterious, small town, cat-related gossip. Happy listening, cat-crime-solvers! Happy 2019, human and furry friends! This week we’re recording one last episode from the Gross household before we trade our vacation cats for our own, everyday cats. This week we’re bringing you a Lillian Jackson Braun cozy short story from her collection called, “The Cat With 14 Tales”, which involves get some truly excellent inner cat monologue. We also start the year with some real first-hand cat crime-solving – what could be better than that?! Happy Christmas Eve, Happy day off, and/or Happy Monday! We're sending you all our kitty-fueled love this holiday season along with one last festive Christmas special. Today we watch and gossip about the season one holiday episode of the 90s classic (and futurist cat-centric program) Early Edition! ...all from the comfort of our dad's beer stash cave room. Don't miss this Kyle Chandler, orange supernatural tabby cat and Santa con-artist filled time! Happy birthday, Jesus, Santa stole your bible! Tune in this week as we solve the murder of one Santa and discover a new surrogate Santa who may just be the Tony Soprano of Irish bible theft. We also indulge in a bit of extracurricular cat chat as "Purring Around the Christmas Tree" didn't quite have the high kitty content we're accustomed to and we try to forge a long-distance kitty friendship between our cats over the phone. All purrr usual! Happy holidays, kitty crime sleuths! Today we’re starting a two-part series on the mystery of who murdered Santa in the small New England town of Frog’s Ledge. Join us as we temporarily follow a new cozy mystery solving team (sorry Qwill!) that involves so many dogs, a herd of Alpacas and a gaggle of feral kittens at a Christmas tree farm. Did we mention there’s a cat and dog bakery involved? Come get festive with us! Another mystery in the books! Today we’re bringing you the conclusion of The Cat Who Knew a Cardinal and, boy, does this cat know a lot of different types of cardinals. Join us as Qwill, Koko and Yum Yum unearth a potential illegal saffron ring and learn about the many uses of frozen cat food as a weapon against murderers! Happy crime-solving, mystery lovers! Get ready for some hot goss because this book is the juiciest yet! Don’t miss our first part of The Cat Who Knew a Cardinal series where we bring you the local Moose County rumor mill and wild, wild conjecture on who might be a murderer. We also talk taking kitty mysteries on Hinge dates and a mystery book store so mysterious it doesn’t even exist. Enjoy, cat crime solvers! Ep 5: The Grumpy Cat Who (Surprise) is Actually Julia!